One aspect of the urban environment we all complain about is the increase in noise. But the din of modern cities is not only an annoyance to us humans (not to mention being damaging to our health), it also affects the life of wild animals that find themselves in an increasingly urban world. High levels of ambient noise are particularly problematic for animals that use sound to communicate, as it masks their signals and thus impairs the exchange of vital information. This is the case, for instance, in many birds, where males use their songs to attract mates and to defend their territories against rivals. Recent research has shown, however, that birds are equipped with means to deal with some interference from environmental noise, for example by increasing their vocal amplitude. On the other hand, not all characteristics of urban bird songs are necessarily an adaptation to reduce acoustic masking but could also be epiphenomena of sound production mechanisms or the urban ecology of birds. Impairments of communication may eventually lead to reduced reproduction, which could affect entire bird populations. 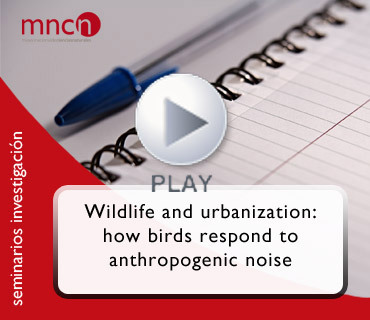 I will review the latest findings on how noise pollution may change avian communities. Overall, I advocate that future research on urban behaviour and ecology needs to go beyond correlational data, as we need experimental studies to recognize the causal role of human activities in altering ecological and evolutionary processes. Presentación: Diego Gil, científico titular, departamento de Ecología Evolutiva, Museo Nacional de Ciencias Naturales, CSIC.